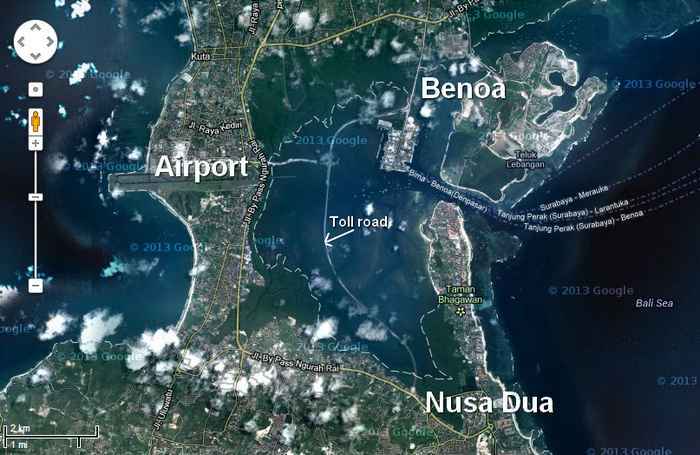 Nusa Dua-Benoa-Airport toll road whose construction will be completed in August this year, has now seen its trajectory on Google Map. Tracks Bali toll road is planned to be used in the month of August 2013. Nowadays we can see this highway through Google Map. Whether what Google looked like Bali, so the toll road built over the sea in Bali, it has been shown by Google Map. Bali toll road images that appear on the Google Map, does not display the current state of the project. For example, part of the road construction on the interchanges Ngurah Rai Airport, has not been installed asphalt. Though the actual current conditions, part of the floor was paved roads like the road that was ready to pass the vehicle. In addition, on the north side of the existing highway underpass at the intersection sightings Dewa Ruci is speed up the process. Even on the west side of the toll road, it appears the roof of the building construction expansion of Ngurah Rai Airport.